Christ’s ministry in the flesh started officially after being baptized by John. We read about this event in Matthew 3:13-16; Mark 1:9-11; Luke 3:21-22; John 1:31-34. This baptism is referred to in the Bible as “the baptism of John” (Acts 18:25; 19:3). This baptism was ministered before Christ’s death on the cross and his later resurrection. It was a baptism of repentance (Acts 19:4), and pointed forward to what Christ would have done through his death and resurrection. The baptism of John is therefore not the same as the sacrament of baptism as administered in the church. In fact, when Paul discovered that the believers of the assembly of Ephesus were baptized with the baptism of John, he did not accept it as a valid baptism for those belonging to the church. He told them that John referred to the One coming after him and that the people should believe in Him. Therefore, Paul re-baptized them in the Name of the Lord Jesus (Acts 19:4-5). The baptism of John was ministered in the Name of Jahweh, while the sacrament of baptism is administered in the Name of the Father, the Son and the Holy Spirit. The sacrament of baptism was therefore instituted after Christ’s resurrection in Matthew 28:19, and could only then be administered in the Name of the Triune God. Through this baptism, Christ first of all identified him with our brokenness and sinfulness. Christ was without sin, but He identified with the truth that man should die in his sin and be resurrected in a new life as symbolized in baptism. Therefore He said to John who thought that Christ does not need baptism: Let it be so now; it is proper for us to do this to fulfill all righteousness. (Matthew 3:15). In other words, He identified with the fact that man needs salvation. 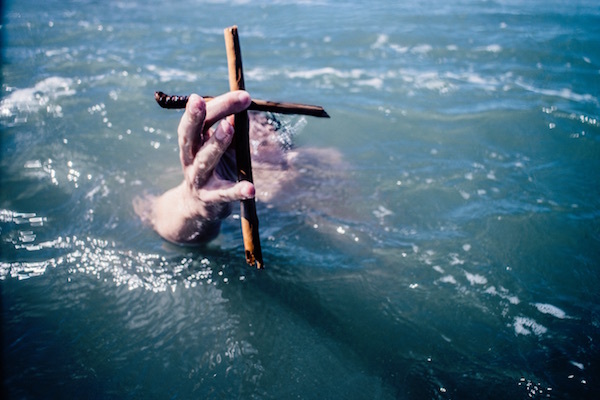 Secondly, Christ’s baptism in the Jordan river was a confession that the cross was a necessity. If there was no cross, the baptism of John was stripped of all meaning. John’s baptism was a baptism of repentance (Acts 19:4), and no genuine repentance can realize without the cross and resurrection of Christ. By being baptized by John, Jesus expressed his willingness and faithfulness to be crucified. Through this baptism He has said openly for the first time “yes” to his Father in terms of being crucified. Mark 10:38 Jesus said to them, “You will drink the cup I drink and be baptized with the baptism I am baptized with”. Luke 12:50 But I have a baptism to undergo, and how distressed I am until it is completed. In both these verses, baptism points to what Christ would have done for us through his death and resurrection. The cross was the actual baptismal fond of Jesus Christ. There He was literarily baptized (immersed) into death, and later literarily resurrected from the death. Strictly spoken, Christ was the only one that was literarily baptized; all other forms of baptism only imitate the baptism of Christ on the Cross. We can in faith identify with this baptism, but only Christ could undertake it – only He was able and fit to die and be resurrected for our sins. This means that Christ’s baptism on the cross was the fulfillment of the baptism of John. To be still baptized with the baptism of John, will boil down to a denial that Christ has already died and has been resurrected for us. After his resurrection Jesus said to his disciples: Therefore go and make disciples of all nations, baptizing them in the name of the Father and of the Son and of the Holy Spirit. (Matthew 28:19). The reason why this baptism was instituted after Christ’s death and resurrection, was because it symbolizes his death and resurrection. Paul is clear in this regard: Or don’t you know that all of us who were baptized into Christ Jesus were baptized into his death? We are therefore buried with him through baptism into death in order that, just as Christ was raised from the dead through the glory of the Father, we too may live in a new life. (Romans 6:3-4). The baptism of John was part of the Old Testament rituals that pointed forward to what Christ would have done on the cross. The sacrament of baptism points backwards to what Christ has done on the cross. The baptism of John speaks of the hope that the Messiah will come and bring us salvation. The sacrament of baptism is a confession that the Messiah has indeed come, and has brought us salvation. The crucifixion and resurrection of Christ (Christ’s baptism on the cross) is therefore the link between the baptism of John and the sacrament of baptism. When a believer is baptized into water, it is a public confession that he or she has died with Christ. And when a believer is taken up out of the water, it is a public confession that he or she has been risen in a new life with Christ. The sacrament of baptism is therefore meant for only those who have come to faith in the Messiah. Consequently, in the New Testament there is only one baptism. Ephesians 4:5 There is … one Lord, one faith, one baptism. In river Jordan the baptized Of John. Thanks ATS for a very comprehensive and informative article on baptism. I have been enriched in my knowledge of the subject.